Automatic Voltage Regulators is the equipment which provides constant output voltage to load. Generally, it has been observed that there is never a constant supply of voltage (230V in Single Phase or 415V in 3 Phase) in AC Main Supply. Usually, it varies from 150V-300V and 300V to 500 Volt. Hence, due to which the severe conditions can emerge like Over Load Conditions, Heavy Line Losses, Poor Power Factor, Problem of Machinery Damage, and many more. Generally, during daytime the connected load is more to main supply and hence there is dip (low voltage) and in night time the voltage supply is more as the connected load decreases. Due to such fluctuations in AC main supply it results in frequent breakdown, low production and also loss of energy. Nowadays, Power Companies insist the consumers to install the Servo Stabilisers to improve power factor and the life of the machinery, to get the better results in power saving. But Voltage is also important factor to save the power loss. Technically it has proved that Transformers, Motors and all other machines works very efficiently and with minimum breakdown at constant voltage supply of 415V or 400V. Hence, installing Servo Stabiliser is useful not for minimum breakdown and life of machinery installed but also for the power saving in high time of huge energy crisis all over the world. The entire load can connected to one single Servo Stabiliser or can be installed according to the individual machine's requirement. But the cheaper idea would be to install One Servo Stabiliser for entire load. SAKTHI Servo Stabilisers is the brand name for manufacturing and it covers all problem mentioned above and is effective in power saving. 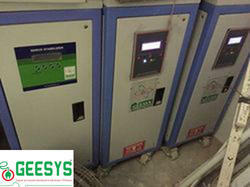 "GEESYS" Servo Stabilizers complies IS 9815 - Automatic line voltage corrector and latest amendments. Our range includes stabilizers in various specifications that suit the input voltage variations of industries, commercial buildings, residential buildings and small businesses. The stabilizer have efficiency better than 95% at full load and voltage regulation. 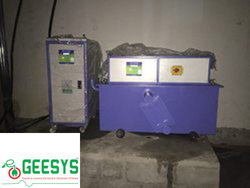 GEESYS Servo StabilizersManufacturer, exporter and supplier of Balanced Servo Stabilizers. Our stabilizers are specifically made for providing a continuous output voltage for single. These stabilizers are suitable for three phase applications with stability - % of the efficiency, which can be maintained as high as 98% or more. As no one likes to risk the life of costlier appliance, these are designed in a way that ensures longer service life. Moreover, these are extensively used in CNC machine, electrical equipment, motor lab equipment and medical equipment. Temperature 50 deg atmospheric temp. 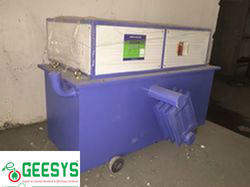 GEESYS Servo Stabilizers are well-known for the qualitative features of high durability and effective performance. 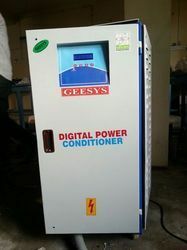 Available under the brand name of "GEESYS", these precisely engineered products are high performing and easy to install. These servo voltage stabilizer has been designed according to the International Standards. Our servo stabilizers are very effective for power and voltage control under conditions of extreme voltage fluctuations. 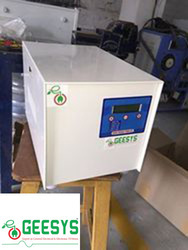 SERVO VOLTAGE STABILIZER in Chennai. We are a leading Manufacturer of Servo Voltage Stabilizer, Automatic Voltage Stabilizer, Servo Stabilizer, Oil Cooled Servo Stabilizer, Air Cooled Servo Stabilizer, Oil Cooled Servo Voltage Stabilizer and Air Cooled Servo Voltage Stabilizer in India. 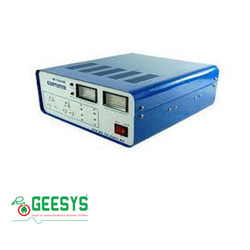 Servo Stabilizer is the equipment which provides constant output voltage to load. Generally, it has been observed that there is never a constant supply of voltage (230V in Single Phase or 415V in 3 Phase) in AC Main Supply. Usually, it varies from 150V-300V and 300V to 500 Volt. Hence, due to which the severe conditions can emerge like Over Load Conditions, Heavy Line Losses, Poor Power Factor, Problem of Machinery Damage, and many more. Generally, during daytime the connected load is more to main supply and hence there is dip (low voltage) and in night time the voltage supply is more as the connected load decreases. Due to such fluctuations in AC main supply it results in frequent breakdown, low production and also loss of energy. Nowadays, Power Companies insist the consumers to install the Servo Stabilizers to improve power factor and the life of the machinery, to get the better results in power saving. But Voltage is also important factor to save the power loss. Technically it has proved that Transformers, Motors and all other machines works very efficiently and with minimum breakdown at constant voltage supply of 415V or 400V. Hence, installing Servo Stabilizer is useful not for minimum breakdown and life of machinery installed but also for the power saving in high time of huge energy crisis all over the world. The entire load can connected to one single Servo Stabilizer or can be installed according to the individual machine's requirement. But the cheaper idea would be to install One Servo Stabilizer for entire load. 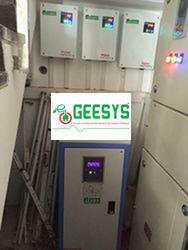 GEESYS Servo Stabilizers is the brand name for manufacturing and it covers all problem mentioned above and is effective in power saving. We are a well-known organization that is engaged in manufacturing and supplying AC Voltage Stabilizer. These products are designed to cover application areas including textile machinery, CNC machines, lifts & elevators, package units and plants. Available in different specifications, our range is highly demanded amongst clients. To meet the various requirements of the customers, we are involved in offering a wide assortment of Solar Power Converter.